This is a long overdue update to let you know I am alive and well and living in Switzerland. I’m sorry I have not posted much since the big move from La Petraia, but alas I lost my muse. Petraia was the inspiration for so many of my posts and after leaving her I have needed some time to reflect and to think about what the focus for this blog should become sans Petraia. My life today couldn’t be more different than it was a few months ago. Instead of a millennial stone farmhouse on a property once inhabited by Etruscans I am living in a 45 square meter modernist apartment in a small Swiss village in the French speaking canton of the Valais. Instead of my grand Petraia country kitchen with 6 ovens, 6 fridges, 3 dishwashers and 4 freezers I now have a mini-kitchen with two induction burners, a small steam oven, a half-size refrigerator and a pint sized drawer dishwasher. Most of our meals are cooked simply in my trusty little Lagostina pressure cooker or my beloved old thermomix. Instead of that magnificent orto, where for the past 15 years we grew all of our own food, I shop in local markets every week. I no longer have to rise at 5 am to harvest, plan menus and write prep lists before our staff arrive at 8. These changes are all intentional and they are all things I have been enjoying immensely simply because they are such a sharp contrast to my previous life. There are wonderful farmers’ markets everywhere here. I can walk for half an hour into the mountains and forage for berries, mushrooms and wild greens. Right now it is wild garlic season and we are eating that almost every night in some shape or form. While I miss our friends, our staff and all the wonderful guests who came to visit us at Petraia I am enjoying this simpler life. At least for the moment while I contemplate what the next big project is going to be. In spite of the move and the fact my life now is taking place in French instead of Italian, there is still much that remains unchanged. I am still blessed to find myself living in paradise. Instead of Chianti’s rolling hills I have a view of one of Western Europe’s largest freshwater lakes, Lac Leman (Lake Geneva) and the UNESCO world heritage Lavaux Vineyards that line its south-facing north shore. Behind them rise the majestic snow covered Alps of the Vaud and the Bernese Oberland. Our apartment building is just few steps from the lake and a ferry stop where a 100 year old steam powered ferry can take us to Vevey, Montreux or Lausanne in a few minutes. There is also a quaint country train station a few steps away where the little red Swiss train stops punctually every hour, a convenience we certainly did not enjoy at Petraia. Like Chianti, this is a region where there is still lots of traditional life. Small family farms are the norm in the alps and they not only beautify the landscape but produce lots of delicious food. Most towns and villages have land set aside for community gardens where residents can grow their own fruit and vegetables. In typical Swiss fashion, these small, family-sized plots are beautifully designed and impeccably maintained and it is a pleasure to stroll through them and see the incredible bounty produced in such a small area. All over the alps cows are still taken up to their mountain alpage pastures every summer to graze in some of the most glorious and pristine alpine settings I have ever seen. Lake Geneva is full of perch, white fish, trout, pike and char and there are lots of local fishermen I can buy them from. Of course I have discovered Swiss cuisine is not just about cheese and chocolate. Like Italy, the food ways here are ancient and complex. Each region and frequently each village, boasts their own specialties. It would take me more than a lifetime to discover and decode them all. And like Italy this is a country where traditional foods are both celebrated and protected. Discovering them has been an adventure every bit as inspiring as producing all our own food was for me at La Petraia. And there is more. We are just a stone’s throw from another special country and another inspiring region. From our village I can walk into France to a cafe, or to buy some delicious French cheese and a baguette. 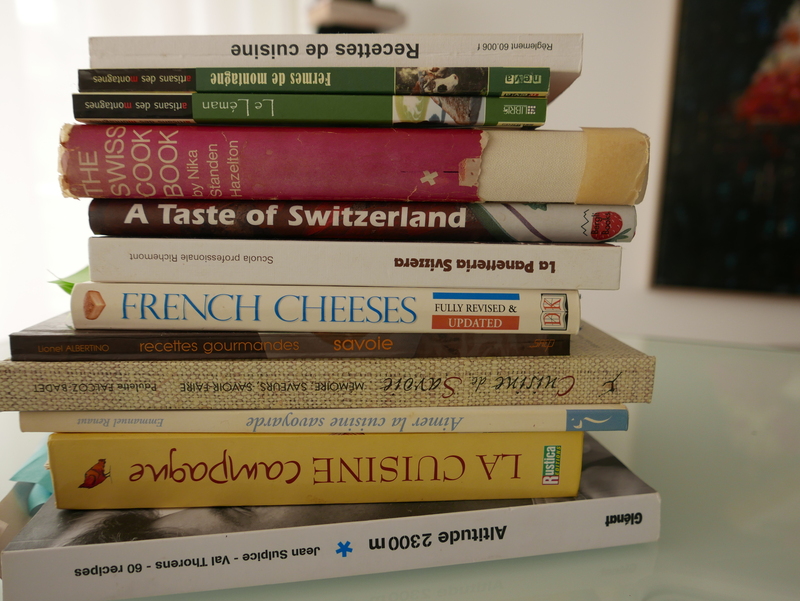 This is the magnificent Haute-Savoie region and here I have found another whole world of culinary exploration awaiting me. Finally, in half an hour we can drive to some of Europe’s best ski areas and many of its most beautiful alpine villages. For the food-motivated, this is an exceptional and often undiscovered part of the world. Thank you for your patience in my time away from posting. I hope you will continue to follow me here. I plan to post frequent photo essays and less frequent in-depth pieces on the traditional foods and food ways I discover both here and on my travels. There may be the occasional recipe. I am posting most days on my twitter feed @lapetraia and also at Food 52’s cool new (Not)Recipes App. For 15 years I rarely left our farm and all the meals I cooked were based entirely on the bounty we produced at Petraia. I hope the following pictures give you a glimpse into my new life, and how overwhelmed I sometimes feel by the abundance surrounding me now. So to start the reboot, here is a look at the two Haute-Savoie markets I visited this Easter weekend in nearby Evian-les-Bains and Chamonix. This is my closest market just half an hour away and one I usually get to every week…. So happy to hear from you… Welcome back… Change is good… Looking forward to following your “new” life… Happy Easter from the New England coast… Lobster for lunch here! Thanks Elyse and enjoy that lobster! You were on my mind today and can’t believe I checked to see what you were doing. Your pictures are really great.. Very happy to hear you are having some well deserved R&R. Don’t forget if you are this way to stop by. Fantastic that you have more time for your own leisure and to bring us into your new surroundings…beautiful shots!! !